OK, I admit it. 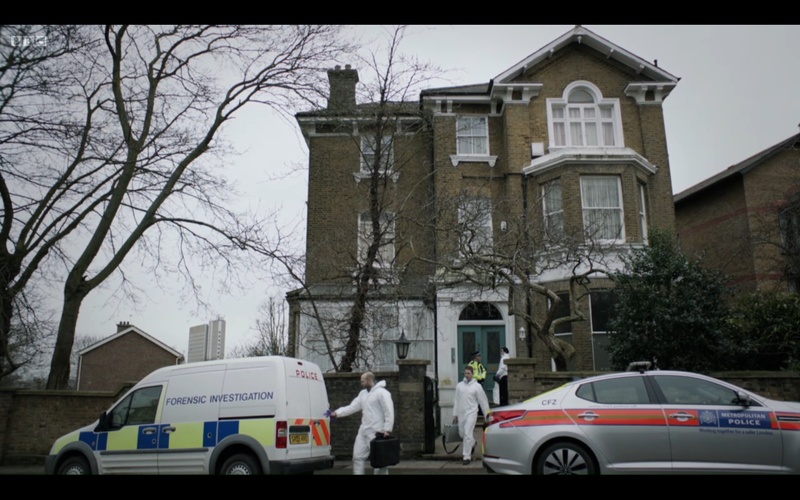 The house from the excellent new BBC drama “What Remains” was driving me nuts. It’s somewhere in Blackheath, but where? I wandered up and down Pond Road, thinking it was near the railway bridge… Close, but no cigar. I knew I’d seen it before. Then one of the production designers tweeted that it was in Eliot Park. And here it is, looking considerably less spooky surrounded by leaves and blossom on Google Streetview! There’s a great post about the production here. Amazingly, the interiors of the house were all shot in a studio. 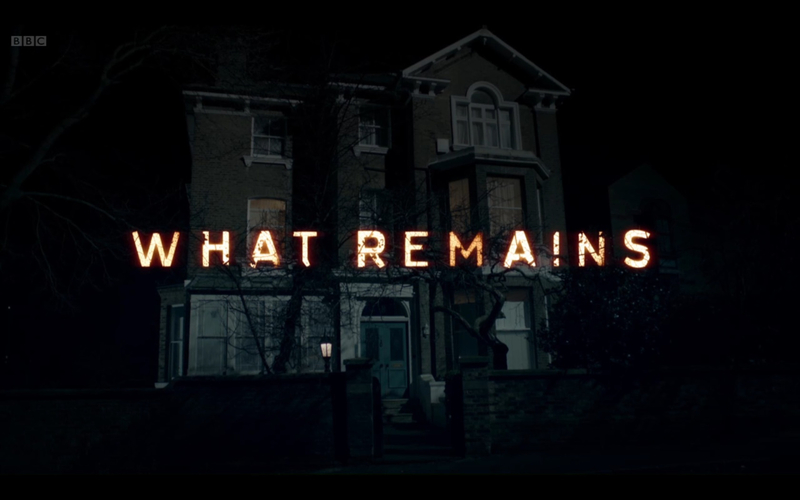 It’s a good first episode – hopefully the other three parts will live up to the first. If you’ve ever lived in flats inside a converted Victorian house, it will push many buttons – the way sound travels in unexpected ways, the timers on the lights, the uncared-for communal areas. It has lots to say about modern life in a city, and online too. Don’t be put off by Frank Gallagher. It’s a subtle performance, and the house really feels like the star of the show. Anyway, there’s a good review of the first episode in the Telegraph, complete with a fantastic new genre “Norwood Noir”, which should clearly be “Blackheath Butchery”… Can’t wait to find out whodunnit. It’s clearly not going to be the teacher. It feels very strange to see the name of my blog in the shop windows around Blackheath. I sometimes feel as though this blog doesn’t really get published anywhere other than on my own screen. I had the same experience when I went to the lovely Spice of Life curry house, and saw part of my review on their menus a while back. (Pretty sure it’s gone now, but it was fun whilst it lasted). Instead of the charity workers having free access to the Old Football Pitches, they will have to pay a total of an estimated £6,000 each summer, and if the charges are not paid then the police will be called. These charges are supposedly for the “management” of the space, but nothing has actually been done to improve the Old Football Pitches. The only change is that there are now charges when there were no charges before. Does this part sound familiar? This is part of a trend. Hyde Park, like many other public spaces, is now shifting into becoming a “venue” and usage is becoming a revenue stream. What are public goods are being turned slowly into private goods: you will get what you pay for. The deputy chief executive of the Royal Parks even assured the charity softball players at a recent meeting that one often only appreciates something if it is paid for. Disgraceful. There’s a petition here. What? 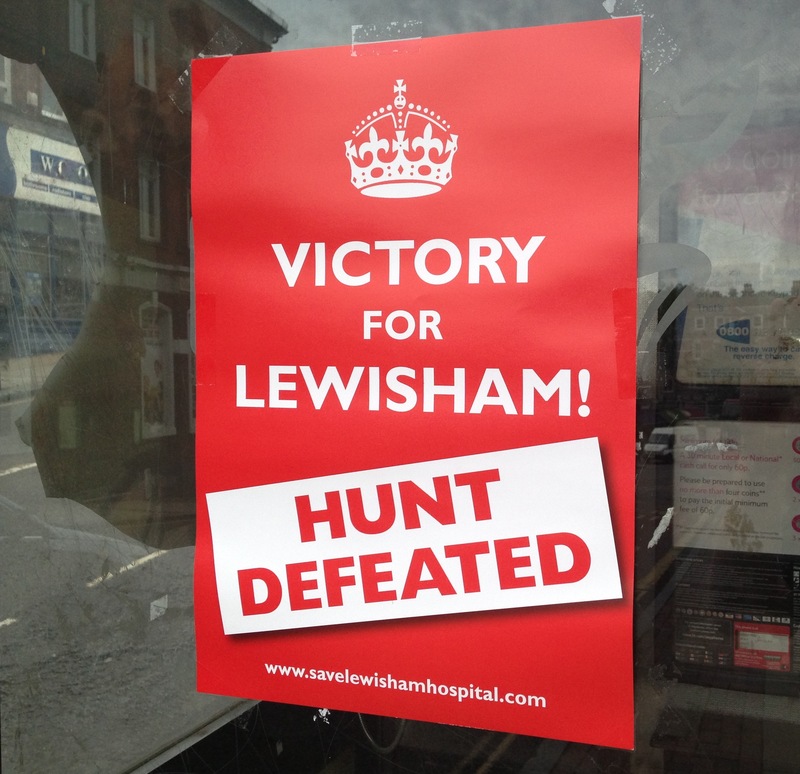 Not a word from the Bugle, the Blackheath Society or the Blackheath Village Residents’ Association in response to the fantastic ruling by the High Court that Jeremy Hunt was acting outside his powers when he announced the downgrading of Lewisham Hospital’s maternity and A&E departments?? The absence of comment from our local bloggers and websites could mean that not everyone is aware of a petition seeking to persuade Jeremy Hunt to accept the decision and not spend more taxpayers’ money appealing it. Local people have won a sensational battle, but the war goes on. Please sign the petition and forward it to absolutely everybody! Following on from yesterday’s review of The Blackheath Seance Parlour, here is a Q&A session with Alan Williams, the author. Please note that the interview contains spoilers, so if you haven’t read the book yet (you should), please go to the review page instead. Q: You obviously spent a great deal of time researching the local area, as mentioned in the appendix. Are there any historical leaps that you had to make for artistic purposes? A: There are. One of the most iconic buildings in Blackheath is the Tea Hut and although it wasn’t standing there in the 1840s, I had to drag it back in time to be in the book. It’s too much a part of Blackheath to omit. I also had to play with the time frame of the Clarendon hotel. In the early 1900s it was three separate houses used by the ship builders of Deptford. One became a bed and breakfast but the rest of its history is at best vague. And then there is Montague John Druit. Q: Why the decision to make Montague John Druitt the murderer? Did you spend much time reading about his association with the ripper murders, and his unfortunate demise? Do you have an opinion about what really happened at the school where he taught? A: Initially, I wrote Druitt in because I wanted to give a nod to a different part of Blackheath’s history but the more I read into his background the more intriguing it became. His is a story in itself. He was a respected barrister who also took on a job in a school in Blackheath. There was an accusation that he had interfered with a boy there, though it was never proven, but the social shame of being homosexual during that age, the passing of his father, then his mother’s mental decline, incarceration and death six months earlier had to have played a huge part in his own mental state. And because there was a family history that increasingly revolved around mental illness, particularly in that unenlightened age, he would have been frightened for his own sanity or at least aware that it might also claim him and he hinted at this in the letter he left. So having been dismissed from the school and with the (supposed) severance cheques from the school still in his pockets, he wrote a note reading “Since Friday I felt I was going to be like mother, and the best thing for me was to die.” Then he filled his pockets with stones and threw himself to his death in the Thames. On top of this came the accusations that he was, in fact, Jack The Ripper. There is much that isn’t known about Druitt, so drawing him back and placing him in The Blackheath Séance Parlour allowed me to use the switch of personality that was, I think, placed on a frightened and lonely man during a witch hunt. The more I think about Druitt, the more I want to write his novel. Q: Were there any other local characters/places that you wanted to include but couldn’t? A: The church was the biggest shock. The novel is set just before the building of it had begun and although this played out somewhat as a strength, my first reaction was ‘How can I write a novel set in Blackheath with the church missing?’ When people think of Blackheath they think of the church. If you Google it, you get the church. The church is the celebrated icon of Blackheath. In the novel, Blackheath was the only parish not to have a church of its own so I brought in the architect who originally built it and had a horrifyingly drunk Maggie attempt to seduce him in the Gypsy Moth. I brought in a lot of the actual people who did run each shop in 1840s Blackheath. (Thank you Neil Rhind for your book Blackheath and Environs – in my eyes, the Blackheath Bible.) And there were many, many more people with staggering and globally important histories right down to the women on the convict ship, that I would like to have included but Blackheath, once you start digging, offers up such a history that you could write a dozen books about it so I had to put the brakes on fast or mention briefly them in passing. Q: How long did it take to write? Your bio says that you work within the film and television industry. Did script editing bring out the frustrated novelist? How do the two processes differ? A: It took a year to write, then six months to rewrite. The scenes with Maggie in them wrote themselves. She’d walk onto a page and I could almost just sit back and watch what happened. I spent many an enjoyable afternoon in the Hare and Billet writing her. As for the difference between script editing and writing, they are intertwined to a degree but also poles apart. It’s much easier to go in and sharpen other people’s work but with your own, sometimes you can’t see the wood for the trees. I let Séance Parlour sit for six months to gain some distance from it before I went back in with the red pen. Q: If the reader accepts that Klaus Van Dyne is an evil genius, and can graft bodies together to form human wings (which is a fantastically creepy reveal incidentally), why would this gruesome but scientific process cause the children to become flesh eaters? I enjoyed them simply as flying demons – did they need to become vampires too? Do you think of them as vampires? A: Thank you. I see them as people with an altered physiology and with that comes a whole new set of base instincts. Their nurse tries to stop their cat and mouse games with animals when they are children but it becomes clear to her that it’s a part of their primal instinct she can barely suppress. If anything, for them, it’s more about the thrill of hunting or a way of dealing with problems. They are set aside as a species with no peers or role models and they do still depend on injections of various solutions found only in birds and other animals to remain healthy and because of these factors they become a rule to themselves. I didn’t want to create a vampire that skulks about and has an evil plot, I wanted them to be more raw. Q: Whilst reading the book, I had the strange sensation that the people who could contact the afterlife were the rationalists, and the men of the establishment (priests, scientists) were the mystics. Do you believe in contact with the afterlife? The book feels quite critical of organised religion at times – are you speaking through Maggie? A: It was an age when science was beginning to challenge religion and women were beginning to take a stand. The women in Séance Parlour are very strong-minded, Maggie in particular and her dislike of Father Legge turned her against religion. I think it became a battle of wills between the two characters and in turn a battle over the church’s monopoly on faith. Like science, the séance parlour becomes a threat, chipping away the church’s power and influence. 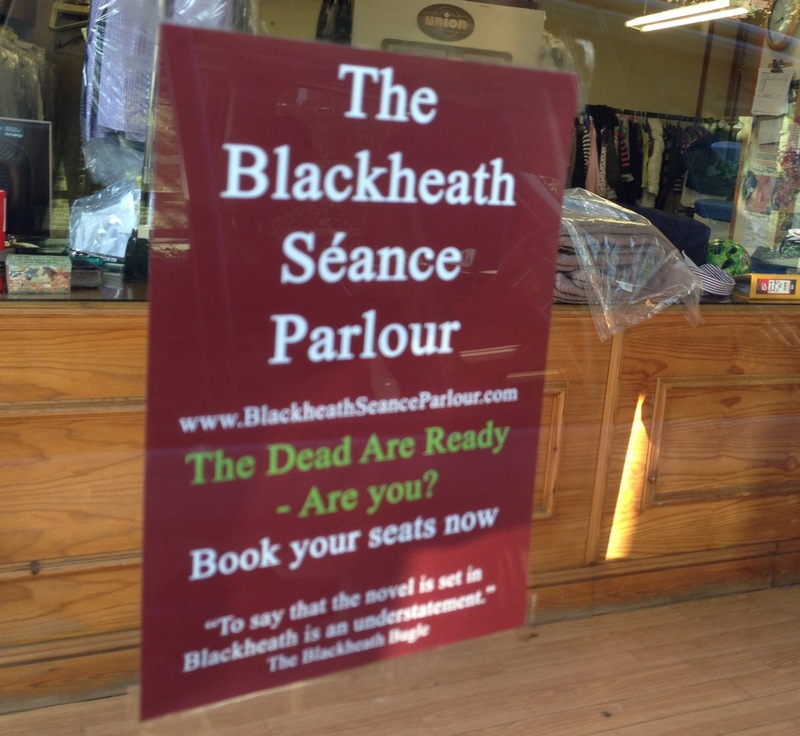 Q: Where’s the spookiest place in Blackheath? A: You have to go a long way to beat a good thick fog on the heath itself. The Blackheath Seance Parlour is on sale now £10 from Amazon.